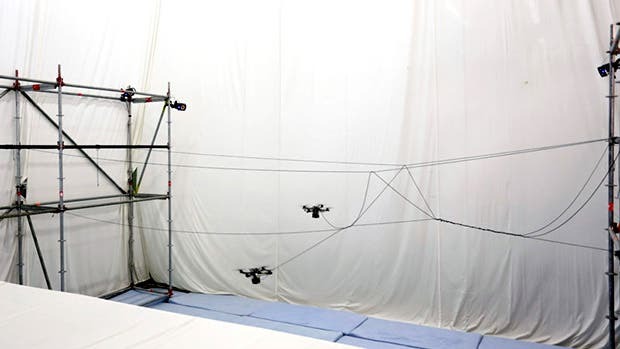 A couple of quadrotors wove a bridge out of polyethylene fiber rope in an intricate dance. Some 120 meters of rope were used by the quadrotors to bridge the 7.4-meter gap, neatly tying knots, links, and braiding. Ultimately, the final test was passed after an ETH Zurich’s Institute for Dynamic Systems and Control student crossed the robot-manufactured bridge. The prospects are very clear: the construction workers of the future might be drones or robots. Of course, there’s a long way from a simple knotted rope bridge – built inside a controlled, lab environment – and something actually useful like a steel and concrete bridge outside. For one, the drones could not have possibly functioned without the uniform steel scaffolding for anchors or the precision indoor tracking system absent which would have made the quadcopters to not only make a mess, but crash and burn. It’s an interesting project, nevertheless. Other projects that hint to the future are the brick-laying robot or the 3D printed house.